If the cheerful harmonizing bursting forth from your favorite tree makes you both smile then why not share it with your wedding guests. Chances are a couple of playful squirrels will drop by to entertain you. Decorate the stately old oak tree’s branches with long, shimmering ribbons and tiny mirrors before stepping under its light dappled canopy to profess your eternal love to each other. 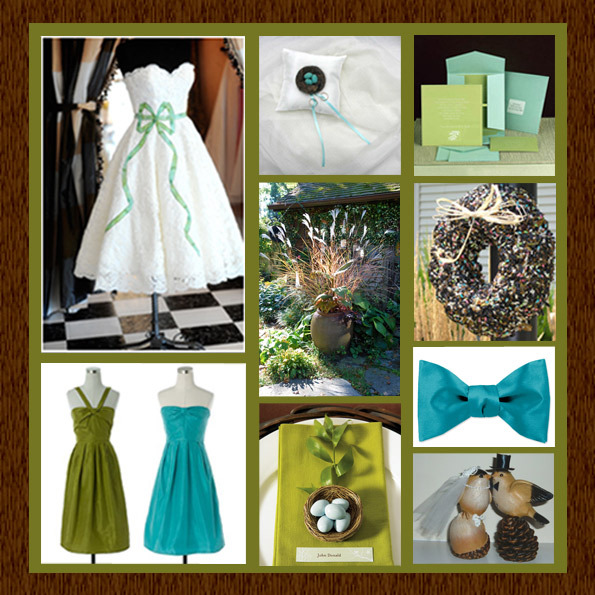 Tea-Length Wedding Dress by Stephanie James Couture; Birds Nest Wedding Ring Pillow from Etsy:Rainsend; Teal Self Mailer with Olive Card at New and Blue; Cement Pot of Ornamental Grass; Birdie Seed Wreath from Songbird Garden; Tropical Aqua and Burnished Olive Bridesmaids Dresses by J. Crew Weddings & Parties; Miniature Bird Nest Favors from Estilo Weddings; Turqoise Freestyle Silk Bowtie by Elite at Wild Ties; Love Birds Wedding Topper from Estsy:WeddingsofDesign. This was written by admin. Posted on Monday, June 8, 2009, at 1:05 pm. Filed under Inspiration Boards. Tagged Accessories, Birds, Bridesmaids Dresses, Cake Toppers, Decorations, Favors, Invitations, Wedding Dresses. Bookmark the permalink. Follow comments here with the RSS feed. Post a comment or leave a trackback.